Thermal Body Wraps: Herbal Concepts, Soothera, Earth Therapeutics! • Herbal Comfort Bootie: Comfort Booties is designed with extra soft micro plush fabric to offer 100% all natural aromatherapy. Comfort Booties is made with 12 herbs, flax and other natural ingredients to contour your feet and help to alleviate stress, tension, cramps and muscle discomfort. 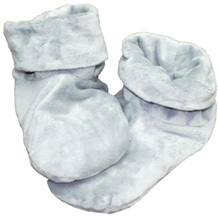 Hot or cold, Comfort Booties can unwind, invigorate and renew your body and soul. Microwave or freeze for immediate remedy. Note: Intended for use in a resting position. Not intended for walking. Charcoal. Measures 10 x 6 x 2 inches. ORDER NOW! • Neck and Shoulder Wrap: Neck & Shoulder Wrap is ideal for alleviating stress, tension, muscle pain, stiffness or cramping. The high collar and large curved shape wraps around your neck and upper shoulders offering additional comfort. The wrap stays in place while walking, standing, or sitting. Warm in the microwave and enjoy penetrating heat and the benefits of aromatherapy from the 100% all natural herbs and grains. Neck & Shoulder Wrap can also be used chilled to help decrease inflammation. Hot or cold the Neck & Shoulder Wrap can help you unwind, revitalize and rekindle your body and soul. Slate Blue. Measures 24 x 16 x 0.5 inches. ORDER NOW! 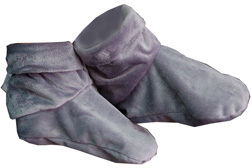 • Herbal Foot Warmer: Foot Warmer is like a relaxing slipper, only big enough for both feet at the same time! Super comfortable with herbs on the top and the bottom of the wrap. Perfect for unwinding while reading or watching your favorite show. Measures 12 x 11 x 0.75 inches. ORDER NOW! • Large Back Wrap: The Back Wrap is ideal for alleviating stress, tension, muscle pain, stiffness or cramping. Packed with 100% all natural 12 herbs and grains, the extra large Back Wrap covers from your shoulders down to your lower back for maximum therapy. Microwave for instant heat therapy or chill for instant cold therapy. Hot or cold the Back Wrap can help you relax, revitalize and restore your body and soul. Comes in a soft and cozy fabric. Measures 16 x 24. BUY NOW! Ingredients: Lavender - Nerve Tonic | Valerian Root - Relaxing Anti-Spasm | White Willow – Analgesic | Chamomile - Nerve Tonic, Relaxing | Rosemary - Headache Support | Peppermint - Pain Support, Anti-Spasm | Spearmint - Nerve Support | Hops – Sedative | Lemon Grass – Analgesic | Yellow Dock - Circulatory Support | Cinnamon - Anti-Spasm | Yarrow - Headache Support | Natural Grains - may include wheat and premium flax seed..
• Neck & Shoulder Wrap: The Neck & Shoulder Wrap is perfect for releasing stress, tension, muscle pain, stiffness or cramping. The high collar and large curved shape wraps around your neck and upper shoulders delivering extra comfort. The wrap stays in place while walking, standing, or sitting. Warm in the microwave and enjoy penetrating heat and the benefits of aromatherapy from the 100% all natural herbs and grains. 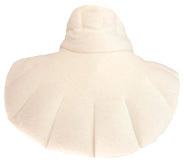 The Neck & Shoulder Wrap can also be used chilled to help reduce inflammation. Hot or cold the Neck & Shoulder Wrap can help you unwind, invigorate and restore your body and soul. Measures 17 x 17 x 1 inches. BUY NOW! • Neck Wrap: The Herbal Comfort Neck Wrap fits snugly around your neck. Created exclusively to fit the contours of the neck, the Herbal Comfort Neck Wrap stays in place while walking, standing, or sitting. It provides 100% all-natural aromatherapy. Each wrap is filled with 12 healing herbs and the highest quality, natural grains available. The Herbal Comfort Neck Wrap helps to relieve stress, tension, cramps and muscle discomfort. Microwave for instant heat therapy or chill for instant cold therapy. Measures 12 x 12 x 1 inches. BUY NOW! 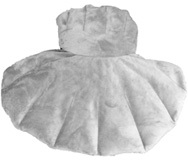 • Herbal Booties: Comfort Booties deliver 100% all natural aromatherapy. Comfort Booties have a removable inner sole filled with 12 healing herbs and the highest quality, natural grains available. The natural herbs contour your feet and help to relieve stress, tension, cramps and muscle discomfort. Microwave for instant heat therapy and chill for cold therapy. Hot or cold the Comfort Booties can help you unwind, revitalize and revamp your body and soul. One size fits most. Measures 10 x 6 x 2 inches. BUY NOW! Ingredients: Lavender - Nerve Tonic | Valerian Root - Relaxing Anti-Spasm | White Willow – Analgesic | Chamomile - Nerve Tonic, Relaxing | Rosemary - Headache Support | Peppermint - Pain Support, Anti-Spasm | Spearmint - Nerve Support | Hops – Sedative | Lemon Grass – Analgesic | Yellow Dock - Circulatory Support | Cinnamon - Anti-Spasm | Yarrow - Headache Support | Natural Grains - may include wheat and premium flax seed. • Comfort Mitts: Comfort Mitts offer 100% all natural aromatherapy. Comfort Mitts are filled with 12 healing herbs and the highest quality, natural grains available. The natural herbs contour your hands and help relieve stress, tension, cramps and muscle discomfort. Using Comfort Mitts promotes fast relief from joint and tendon pain. One size fits all. Microwave for instant hot therapy and chill for cold therapy. 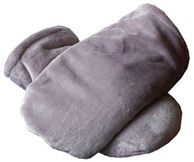 Hot or cold the Comfort Mitts can help you relax, regenerate and recondition your body and soul. One size fits most. Measures 11 x 6 x 2 inches. BUY NOW! • Herbal Warming Scarf/Charcoal: Warming Scarf is designed to wrap comfortably around your neck, and suitable for indoor or outdoor activities. Warming Scarf has 2 extra deep pockets to keep cell phone and keys accessible, while keeping hands warm and cozy. The neck and pockets are padded with 12 natural herbs and grains that contour your body to help relieve stress and tension while keeping you warm and relaxed. 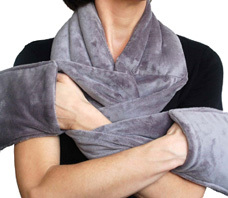 The Warming Scarf can be used for hot or cold therapy. Charcoal. Measures 66 x 6 x 0.5 inches. BUY NOW! • Body Pac: The Body Pac provides an athletic and handy solution to attain 100% all natural aromatherapy relief. The convenient handles make it easy to apply hot or cold herbal therapy to hard to reach areas. The Body Pac is filled with 12 healing herbs and the highest quality, natural grains available. The natural herbs contour the curves of your body and help to relieve stress, tension, cramps and muscle discomfort. Keep one in your gym bag! Microwave for instant heat therapy or chill for instant cold therapy. Hot or cold the Body Pac can help you unwind, revitalize and energize your body and soul. Measures 17 x 17 x 1 inches. BUY NOW! • Eye Pillow: Eye Pillow is ideal for invigorating acupressure points around sensitive eyes while developing serenity and relaxation to the entire body. 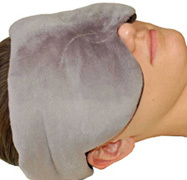 The Eye Pillow naturally forms to your individual features to reduces eye stress, tension, puffiness. Chill in the refrigerator or freezer and enjoy calming relief from 100% all natural herbs and grains. Use room temperature or cold, the Herbal Concepts Eye Pillow will help you calm, renew and recondition your body and soul. Measures 4.5 x 8 x 0.5 inches. BUY NOW! • KOZI Natural Back Wrap: The Organic Back Wrap is ideal for alleviating stress, tension, muscle pain, stiffness or cramping. Made from 100% soft and cozy Organic Cotton Fleece fabric contains 12 healing herbs and natural grains. 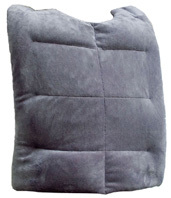 The extra-large Organic Back Wrap covers from your shoulders down to your lower back for maximum therapy. Microwave for instant heat therapy or chill for instant cold therapy. 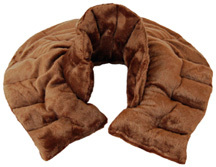 Hot or cold the Organic Back Wrap can help you unwind, restore and energize your body and soul. Measures 16 x 24 x 2 inches. BUY NOW! • KOZI Natural Neck & Shoulder Wrap: The Organic Neck & Shoulder Wrap is great for relieving stress, tension, muscle pain, stiffness or cramping. Made from 100% soft, cozy Organic Cotton Fleece. The extra tall collar and large curved shape wraps around your neck and upper shoulders deliver maximum therapy and extra comfort. The wrap stays in place while walking, standing, or sitting. Warm in the microwave and enjoy long lasting, penetrating heat and the benefits of aromatherapy from the 100% all natural herbs and grains. The Organic Neck & Shoulder Wrap can also be used chilled to help reduce inflammation. Hot or cold the Herbal Concepts Organic Neck & Shoulder Wrap can help you calm down, regenerate and renew your body and soul. Measures 17 x 17 x 1 inches. BUY NOW! • KOZI Neck Pack: Neck Pac is ideal for releasing stress, tension, muscle pain, stiffness or cramping. 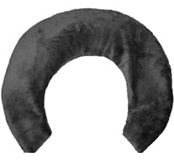 The arched wrap contours your neck offering extra comfort. The Neck Pac stays in place while walking, standing, or sitting. Use Warm and enjoy penetrating heat and the gains of aromatherapy from the 100% all natural herbs & grains. Use chilled to help reduce inflammation. Hot or cold the Neck Wrap can help you calm down, invigorate and restore your body and soul. Mauve. Measures 13 x 12 x 0.5 inches. BUY NOW! Anti-Stress Comfort Wrap: Wrap around the neck, to calm tired, sore neck, and shoulder muscles - or press against the back, to reduce and release back strain. Helps deliver soothing relief to the neck, back, or other problem areas suffering from, soreness. The balmy, mind-calming blend of Chamomile, Lavender, and Citrus offers a relaxing, sensory experience. Filled with rice and a special stress-relieving, aroma-therapeutic combination of herbal essences, this Wrap is devised to soothe and comfort both the body and the mind. Use it HOT, for a soothing, moist heat to relax muscles and ease tensions OR Use it COLD, to cool down and reduce minor swelling. 100% cotton-terry cover is machine washable. Measures 3½" H x 26½" W.
• Anti-Stress Comfort Wrap: Light Green. BUY NOW! • Anti-Stress Comfort Wrap: Tan. BUY NOW! • Anti-Stress Sinus Pillow: Ergonomically designed Anti-Stress Sinus Pillow is filled with a special stress-relieving aroma-therapeutic blend of herbal essences to soothe and comfort both the body and the mind. A luxuriously soft cotton outer shell pampers and coddles-while the gentle, caressing weight of the pillow does wonders to relieve tension and stress. Use it Warm over the forehead to soothe and relieve sinuses and tension headaches, or use it Cool to soothe tired, strained, puffy eyes. Adjustable strap ensures the perfect fit. One size fits most.. BUY NOW! 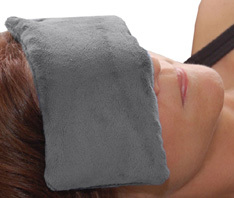 • Anti-Stress Eye Pillow Silk: this pillow weighs gently on tired eyes to calm and comfort. Enjoy the cool sensation of 100% pure silk caressing the skin, as the pillow "flows" naturally over the contours of the eyes and face. This eye pillow is excellent for relieving the stress of every day life. Use while resting, napping, meditating, or right before bed time. 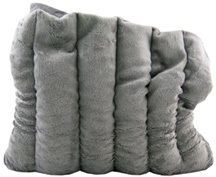 This pillow will comfort eye strain and induce a feeling of tranquility to both the body and the mind. Blended with Chamomile, Lavender and Citrus, and filled with flax seed. ORDER TODAY! • Natural Crystal Salt Massage Stones Deluxe Set: The ancient healing art of stone massage is a modality for physical and spiritual balancing, Using various techniques incorporating warm and cold stones, the body is relaxed to its deepest. Each stone is approximately 3 1/4 inch long by 2 1/4 inch wide by 1/2 inch deep. Sizes will vary within the set due to the stones being hand made. For external use only. 6 pc. ORDER TODAY! MASSAGE TOOLS: Natural Crystal Salt Massage Stones Deluxe Set, 6 pc. • Salt Massage Stones: Two Himalayan crystal salt stones in organza gift bag. Place on skin warmed or chilled with a little massage oil, then rinse and dry stones. For external use only. 2 pc. ORDER TODAY! MASSAGE TOOLS: Salt Massage Stones, 2 pc.